Waikiki Wizard Stones Remind Oahu Visitors of Hawaii History and Hawaii Culture. A Powerful Reminder of Hawaii History in Waikiki! Yeah, the Waikiki wizard stones (Na Pohaku Ola Kapaemahu A Kapuni: The Stones of Life) look just about exactly the same as any other pile of lava rocks that you’ll see everywhere in Hawaii. 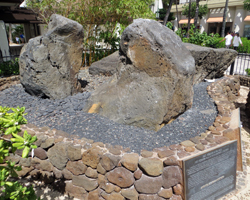 Nevertheless, these stones are significant in both Hawaii history and Hawaii culture because they are believed to have been infused with the mana (spiritual life force) of four powerful Tahitian healers who visited Hawaii more than 500 years ago to administer miraculous cures and teach the healing arts to Hawaiians. The healers names were Kapaemahu, Kapuni, Kinohi and Kahaloa; and according to the legend, they came to Waikiki, Oahu from the island of Raiatea. Their treatments and cures were so effective that they were perceived to be healing wizards, and they became famous throughout the island. Then it came time for them to return home, and they asked for four large stones to be quarried from Kaimuki and brought to their location near the piece of land currently occupied by the Moana Surf Rider Hotel. Throughout a full month of incantations, fasting and prayers, the healers gave their names and their powers to these four stones so that their mana would remain with the Hawaiian people forever. 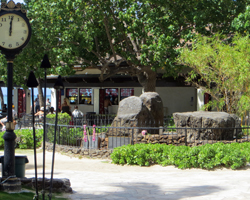 Located on Waikiki Beach between the Waikiki police station and the Duke Kahanamoku statue, the wizard stones are one of many free things to do in Waikiki, but they definitely aren’t a major activity in Hawaii. They have been prominently displayed on a rock platform, given an altar, and protected by a low fence where people frequently leave flower lei as an offering. But that’s really all there is to see and do here. Take a picture as you walk past (or right after you take a picture with Duke Kahanamoku), read the history on the plaque, and then go secure your spot in the sand! You can tell your friends an interesting story when you get back home. Please just remember that the wizard stones are sacred relics to the people of Hawaii. They may look like a bunch of regular rocks, but these are definitely not for horseplay or treating disrespectfully. If you or your kids feel a powerful need to climb some volcanic rock, I recommend hiking Diamond Head. The view from the top is so much better (and you’ll avoid insulting an entire population).